Today, I am featuring the Hero Arts Color Layering Elephants (bundle here). Two of my favorite sentiments from the set include “I never forget a birthday” and “I remembered your birthday.” “Hello” is included as well, making this a versatile stamp set all on its own. Color layering stamps are a great way to achieve depth and dimension without really having to work for it. Shading and detail have never been so easy! If you are a more advanced colorist, take the plunge and forgo the layering and just use the outline of mom (or dad) and baby. A no-line effect could be really fun by only using the middle shading layer… hmmm… my mind is running away with ideas for this set! For this card I opted to begin with the background. I masked the bottom of the A2 Snow Layering panel and airbrushed the exposed area with Copic markers in R35, RV17 and Y17. I allowed the lower left area to fade to white for a smooth transition. Next, I stamped the elephant outlines with my Misti in Charcoal ink. I then lined up the subsequent layers and stamped them in Soft Granite for the shadow and metallic Silver for the full body base color. Some crafters like to layer light to dark. I prefer the outline first, no matter what shade it is. Good news is, you get to do whatever works for you! When color layering, be sure to allow each color to dry before stamping the next. The colors may blur and the edges feather a smidge without dry time. It likely won’t ruin your design, but it won’t be as crisp as it could be. I stamped the balloons in Copic friendly Intense Black ink and colored with Copic in R43, R35 and R39. I added an additional highlight with a white Signo Uniball pen. 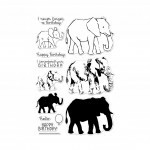 I fussy cut the elephants and balloons, though dies are now available. I adhered an Intense Black Candy Stripe Bold Print strip and stamped the sentiment below. I then adhered the fussy cut elements. I drew in the balloon strings and enhanced the eyes with a black gelly roll pen. I adhered the completed panel to a Snow Pre-Folded A2 card base. I packaged it with a matching envelope so it is ready to grab and go when I need it! I think it turned out mighty charming, if I do say so myself! A linked supply list can be found HERE. Affiliate links are used where possible at no cost to you. I appreciate your support! That is all from me today. I hope you’ve been inspired to enjoy a little craft time of your own. See you soon! Such a sweet card! 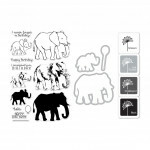 Love the layers on the elephants and how you made the baby appear to be floating away with his big bouquet of balloons!